Foss Harbor marina, which lies on the Pacific Northwest coast in the state of Washington offers stunning views of Puget Sound, a complex system of interconnected marine waterways and basins and home to the Cascade Mountains, the Kitsap Peninsula and the San Juan Islands. A highlight for any keen boater, “one of the great things about the region is its extensive maritime heritage,” says Ian Wilkinson. “Cruising, sailing and fishing are woven into the fabric and boating is one of the more popular pastimes.” There are dozens of marinas within a 20-mile radius, providing a wide range of cruising destinations. 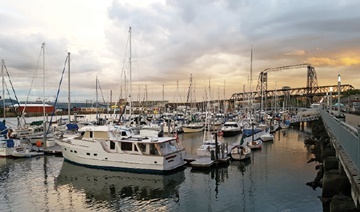 Foss Harbor marina “is literally in the heart of downtown Tacoma and is within walking distance of dozens of world-class museums, shops and restaurants,” he adds. With such a variety of local competition, Wilkinson focuses on providing world-class service and all modern amenities. “Tacoma boaters may have many marina options to choose from, but we believe our facilities and customer-focused mentality help set us apart. We want to make every boater feel like our most important customer,” he says.